Get an Instant Quote by Calling 1-800-318-8940 now! FairLifts helps coordinate helicopter lift solutions for companies and individuals in Fort Walton Beach, FL. The extensive catalog of services includes heavy lift helicopters, aerial cranes, pipeline inspections, and executive charters. Experienced agents are on hand to guarantee your project goals are met. A global leader in reserving professional helicopter lift solutions, FairLifts works with a network of trusted operators that provide cost-efficient and immediate solutions to the helicopter lift needs of companies and individuals. Local operators also offer personal executive services, such as business charters, game day shuttles, and corporate tours. A personal helicopter charter concierge will guide you through the lift reservation process, and ensure all your demands and expectations are met. Fort Walton Beach in Florida, a year-round fishing and beach resort community, is also a military hub with two major Air Force bases, including Hurlburt Field and Eglin AFB. The city is home to Lee's Famous Recipe Chicken and ResortQuest company headquarters. Tourism is seasonal, with spring break and summer being the high seasons. Fort Walton Beach has a large snowbird population, which includes the Fort Walton Beach Snowbird Club. In June, the city hosts the annual Billy Bowlegs Pirate Festival, which is similar to Mardi Gras and consists of a parade, fireworks, and related celebrations. Whether it’s providing assistance to local companies with their heavy lift and inspection projects, flying executives to town on business, or offering charter service to tourists, FairLifts organizes expert and reliable helicopter solutions. 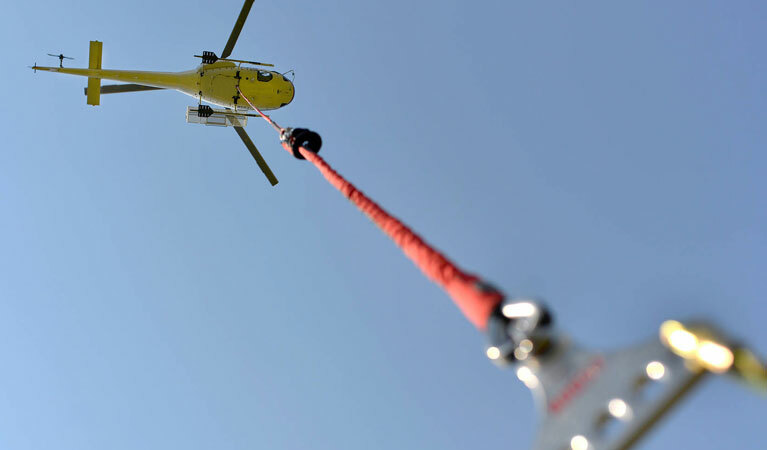 FairLifts’ professional affiliate network offers helicopter lift solutions for numerous activities, including construction, heavy lifting, freight and cargo transport, emergency medical services and agricultural or fishing projects. The FairLifts affiliate network provides expert construction solutions, such as heavy lifting, air crane services, aerial oil and gas assistance, as well as other construction related services, such as freight and cargo transport to and from construction sites. By assisting companies with heavy lift needs, such as machine and staff transport to high installations, our affiliates provide indispensable solutions for large construction projects. Services include the transport of digging machinery or concrete facilitations, and placing girders or large stone structures, among others. Heavy lift helicopters can provide air crane support solutions for projects in inaccessible areas. An affordable alternative to ground cranes, heavy lift helicopters are capable of transporting large items into areas with limited ground access, thereby providing smart and efficient solutions to keep large-scale projects on track and under budget. Helicopter lifts can provide immediate and confidential transport solutions for sensitive materials and fragile freights. Our affiliate network of experienced pilots and first-rate aircraft ensures the safe and secure delivery of important and classified documentation and cargo. Helicopter lifts can provide unmatched transport to patients in distress. By providing immediate access to top medical centers, fully-staffed medical lifts, equipped with life-saving equipment and medication, offer solutions that ground ambulances simply cannot. A network of emergency helicopter operators ensure immediate care when time is of the essence. Contact FairLifts today for more information on the exclusive range of industrial, agricultural, medical and executive helicopter solutions local affiliates offer. Our agents are standing by at 1-800-318-8940 to help you with your helicopter lift needs in Fort Walton Beach. You can also fill in the form below, and an agent will be in touch within 24 hours.